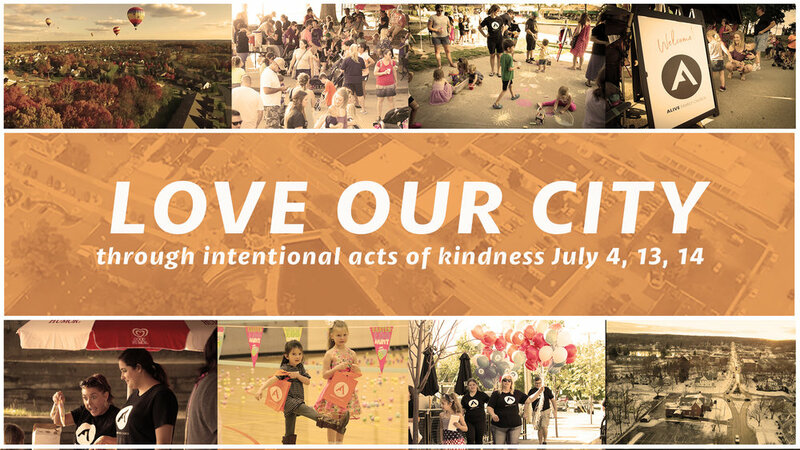 We are going to be intentional to show love to our city through intentional acts of kindness this summer! There are lots of opportunities for you to get involved! Check out the list below and sign-up for the outreaches that you are the most excited about! A group of 20+ people are needed to inflate and pass out balloons along the parade route. This group of people will meet at Realty Concierge Downtown Brighton to inflate and prepare the 600 red, white, and blue balloons. This group of people will also be the ones to pass out the balloons. July 4 | 9:15am-11:00am | Ages: all ages welcome! Walk in the 4th of July Parade with Alive Family Church! We want as big of a crew of people as possible! Wear your Alive Swag and/or 4th of July colors. Kids can decorate their bikes, scooters, or wagons in red, white, and blue and walk in the parade too. The theme of the parade this year is "superhero for a day" so kids can wear superhero gear if they want to too! Bring a bag of candy to pass out as we walk. We will also be passing out flyers to our July series, At the Movies. We will meet at the BECC building. Free popcorn, kid activity, and pictures with Mr. Incredible! We will be serving free popcorn, hosting a free kid activity, and Mr. Incredible will be there live in person for photos! This is a great opportunity to build relationships with people in the community and invite them to the At the Movies series! 2-3 people are needed at the booth at one time (one being a guy in a Mr. Incredible suit! ), in 3 hours shifts. Serve the participating Taste of Brighton stores and restaurants by being a helping hand. Sign-up for one of three shifts where you will stop by and check on the participating stores and restaurants to see if they need help with anything. The three time slots on July 13th are 4-6pm, 6-8pm, 8-10pm. We are excited to give the Scranton Teacher's Lounge a face-lift to be a blessing to the Scranton Faculty and Staff! This Fall, they will come back to a beautifully updated Teacher's Lounge to enjoy! During "Love Our City" we will do the first phase of the Teacher Lounge renovation which involves removing the wallpaper. The teachers have been desiring a Teacher Lounge make over for years, and we are excited to provide that for them! Sat. July 14 | 10am-Noon | Ages: all ages are welcome! We are hitting local parks with popsicles! Parents of young children, this is a great one to get your kids involved in. Alive will provide popsicles & ice, you provide the cooler. We will hit as many local parks as possible giving away free popsicles, with no strings attached. A great way to love our city in the heat of the day!